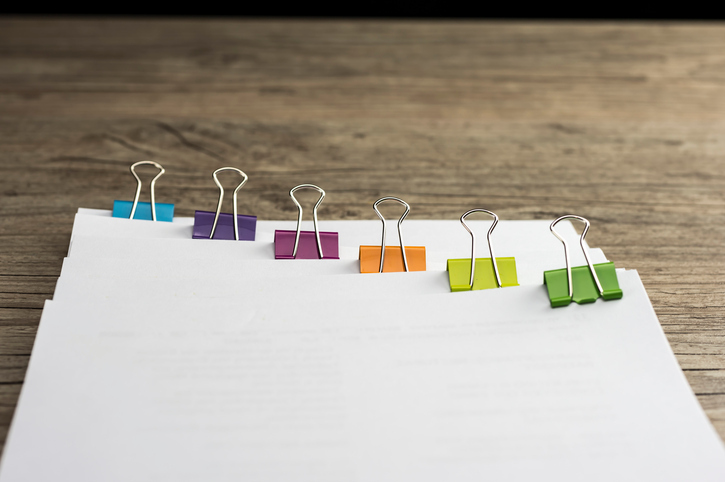 You might know that a clip is a metal or plastic clasp that holds papers or other things together or a jewelry piece used as a decoration for clothing. Related to this sense the verb clip means ‘to fasten with, or as if with a clip.’ But clip has another meaning, ‘to cut off, trim or give shape to something,’ as you might do with scissors or shears. Figuratively it means ‘to make shorter’ and, informally, ‘to hit with a sharp, slanting blow.’ It can also mean ‘to move swiftly.’ Related to this, the noun clip is the act of clipping or a thing clipped off. It can also be a quick blow or a rapid rate or pace. The bundle of papers was held together with a clip. Daphne wore a diamond clip on her lapel. Neil clipped the documents together. The car took the corner too fast and clipped the lamppost. The carriage clipped along the highway. The gardener gave the hedge a clip. The cyclists were moving at a good clip. When talking about firearms, a clip is a device used to store ammunition (usually bullets) so it is ready to use; the clip can be inserted into the weapon. When we use the related adjective clipped to talk about speech, it means that the words are pronounced quickly, but clearly. Normally, this kind of speech sounds abrupt and unfriendly. Clip, the verb meaning ‘to fasten or hold together by pressure’ dates back to before the year 900. The Old English verb clyppan originally meant ‘to embrace,’ ‘to surround’ or ‘to clasp’ as well as, figuratively, ‘to prize, cherish or honor.’ By Middle English (when it became clippen), some of those meanings were becoming rare; the meanings we recognize today (to fasten or bind) appeared in the early 14th century and soon became the main (and then only) senses. Its origin is unknown, but it is almost certainly from a Germanic source. It is related to the Old Frisian kleppa (to embrace or to love), the Old High German klaftra and the German klafter (‘fathom,’ from the notion of outstretched arms), and the Lithuanian glebys (armful) and glomti (to embrace). The noun clip, meaning ‘an item used to fasten’ dates back to the mid-14th century, and comes from the verb. There was an older noun, clypp, in Old English, which meant ‘an embrace,’ but it disappeared long before the modern noun appeared. Clip, as in ‘a piece of jewelry fastened by a clip,’ dates back to the 1930s. Clip, the verb meaning ‘to cut or trim,’ dates back to around the year 1200, and came into English from a Scandinavian source. It is related to the Old Norse klippa, the Swedish klippa and the Danish klippe (all meaning ‘to clip, shear or cut’), and its origin is probably related to the sound of a quick, sharp cut. The figurative sense has been around as long as the verb. The meaning related to pronunciation is from the early 16th century, while the expression ‘to clip someone’s wings’ is from the late 16th century. The noun clip (in this sense) comes from the verb, and dates back to the mid-15th century. Clip originally meant ‘shears’ (we now use clippers for this sense), and the meaning we recognize today, ‘the act of clipping,’ appeared in the early 19th century. Meaning ‘the rate of speed,’ clip dates back to the mid-189th century. The film meaning is from the mid-20th century.